The grittier and slightly more realistic alien invasion film “Battle: Los Angeles” poses and addresses the intriguing question of how the military would respond in the event of a full-on attack at the hands of an unknown enemy. The answer? Clichés; tons of them. Round up the troops, grab whatever clichés you can find so we can get the hell out of this cliché, and under absolutely no circumstances should you leave a cliché behind — unless it’s for the greater cliché. Whatever handheld camera prowess director Jonathan Liebesman has is almost entirely drowned out in these and other unfortunate scripting choices. The film’s exceptional marketing led many to make early claims of “the ‘Black Hawk Down’ of alien invasion films,” but “Battle: Los Angeles” is not the intriguing possibility of an alien invasion film from a military perspective; it’s a military film in which aliens grace us with their presence. I get that the military won’t lend its assistance to films that portray it in a negative light, but “Battle” borders on propaganda in many instances. The overarching theme of the film can be described as nothing other than “the military will fight for us, sacrifice for us and never give up, even in the face of probable oblivion.” Without question, “Battle: Los Angeles” would’ve been a runaway hit in 1950. Any connoisseur of disaster films will tell you the best of the genre make you care about and feel for the characters. Adopt that as a rule of thumb and “Battle: Los Angeles” rates poorly by default. That’s not to say writer Christopher Bertolini, whose last script was “The General’s Daughter” in 1999, doesn’t put emphasis on character backstory, because there’s plenty of it, it’s just shoddy and overrun with soldier/war clichés (the lieutenant’s wife is pregnant, one guys is about to get married, one guy is suffering from PTSD, one guy is getting over the loss of his brother who was killed in the Middle East, one’s a young kid who’s still a virgin and then there’s Staff Sgt. Michael Nantz (Eckhart), who is about to retire and wrestles daily with the demons of the men who died under his command in Afghanistan. If that all sounds novel and touching to you, you have some serious movie renting to do once you get out from that rock. Even Eckhart, who really sells us hard on his leading man ability here, can’t overcome the stuff he’s forced to say. The invaders (other than making a Predator-like clicking noise) end up being more intriguing than the human characters because the film effectively paints them as mysterious and frightening. Science-fiction fans will quickly lose interest in the trodden war story characters and become much more fascinated with who and what these aliens are and how they operate. In most cases, focus on character development would be applauded, but Bertolini and Liebesman seem to have misjudged how effectively they developed them. There’s too much downtime in the action for them to talk to each other, bicker, share their emotions and make poor jokes at each other’s expense. Add screen composer Brian Tyler’s elongated undertones a la “Platoon” and the scales are tipped toward an embarrassing form of melodrama. “Battle: Los Angeles” talks itself into intolerability at times. Like that friend you had in middle school that seemed cool but just wouldn’t shut up and thus became irritating despite the best of intentions, every time a character opens his or her mouth in this film, it gets worse. The action pauses much more than necessary and the space gets flooded in with emotional speeches, wisecracks and stuff we’re supposed to find touching. All this would be a bit more effective if the magnitude of the situation came entirely across, but despite Liebesman’s eye for action shot composition, it never does. 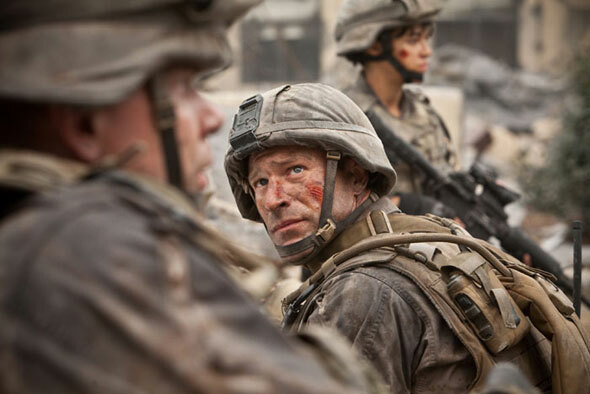 The scope stays too narrow on our military friends and the film never develops the sense of life-threatening urgency that makes the disaster genre so effective in general. I’ve no doubt that if Bertolini spent half the time he took writing things for the characters to say and invested it in creating moments for the characters to interact with each other fundamentally, “Battle: Los Angeles” could’ve been much better. I’m all for solo scripting duties, but another more experienced writer needed to be on board it seems. Rather than let his characters grow organically, he imposes their backstory upon us, which also becomes painfully more obvious with inexperienced actors of which there are many in the film. From a visual standpoint, “Battle: Los Angeles” commands attention with hard-hitting action and engaging scenarios, but for a film that so clearly appears to follow in the footsteps of some of science fiction’s finest films (“War of the Words”) and more progressive offerings (“District 9”), it departs so drastically from that pedigree with the military-heavy approach. Science fiction usually serves as a social or political allegory, not a motivational poster for societal values such as courage and determination. Regardless, rubble, carnage and mysterious aliens ought to be enough to get the job done, but they’re not.